I'm so very excited to officially announce the My Precious Quilt-a-long! We all have some fabric in our stash that's our favorite or the stack that you've been most reluctant to use. Wonderland, Mendocino, FMF, Park Slope, Munki Munki, Full Moon Forest, Neptune, Katie Jump Rope, Good Folks, Bohemian, Garden Party, Recess, Swell, or whatever YOU hold dear, it's time to use it! The fabric doesn't have to be desirable to anyone but YOU! This QAL is designed to push you, not to compete with other people for who has the most sought-after stash. This is going to be the most relaxed QAL ever. You don't even have to make a quilt! How's that for relaxed! All I'm asking is that you take fabric precious to you and make something, anything! Make quilt, a pillow, a table runner, a mug rug, a mini quilt, a bag, a pin cushion, a pot holder, an apron, etc. I really don't care what you make, as long as you're using the fabric you never thought you could cut. It's not doing anyone any good just sitting there! It's time to use it! This is the start of my own quilt. I'll be using my Heather Ross stash to make a rainbow of log cabin blocks. My goal is to make at least 20 blocks (each finish at 15"). 1. You must use fabric that you've been hoarding. Not your regular old stash. The special stuff. You know what I'm talking about! The stack you occasionally bring out to pet or maybe the precious scraps you've been saving forever. 2. It does NOT have to be hard to find or out of print (HTF/OOP), but it can't be brand new. I'll admit, my original intention was for everyone to use these types of fabrics, but realistically I know that not everyone has them in their stash. My only request is that you please don't pick something just released. Tula Pink herself is giving something!!!! Fat Quarter Shop is providing two $25 gift cards!!!! Nest Pretty Things (one of my favorite etsy shops) is offering a pair of earrings! Jenny from Cut.Sew.Iron.Repeat is giving away a charm pack of OOP Alexander Henry prints! Linda from Handmade by Linda is giving a flat bottom pouch of your choice! My friend, Dar, is donating a charm pack of the COMPLETE Katie Jump Rope collection! Sarah from Blue Print Textiles is giving a FQ bundle of HTF fabric AND a copy of her upcoming pattern! Rachael from 2nd Avenue Studio is giving a bundle of HTF fabric and one of the fabulous templates she helped create with Jill at TabSlot on etsy. 5. I've created a Flickr group HERE. I'd really like it if everyone considering linking up would also join the Flickr group. I promise we don't bite! This is where you can post in-progress pictures, discuss ideas for how to best use your precious fabric, swap for other precious fabric, and, in general, have someone to hold your hand while you cut, cut, cut!!! 6. Get ideas from our Pintrest board! 7. Your project can do double duty! If there is another QAL, swap, gift, or project you want to do, you can kill two birds with one stone if you use your precious fabric! So are you in? This QAL is all about being brave. You can do it! Grab a button (on the right side of my blog) and tell your friends! This QAL is made for me! I'm hoarding or "saving-for-the-perfect-project" Swell, Bliss, Katie Jump Rope, the original Freshcut as well as another Heather Bailey line that is so old I can't remember the name. Count me in!!!!! Woot! I am just breaking into my precious Neptune stash and having a blast! I'd be happy to donate a prize. Maybe lightning bugs? Send me a note. OK, so last month I busted open my hoarded FQB of Bliss. This was a difficult thing for me, but I am excited to know that I will have something beautiful. I've started a BOM on Craftsy with it, so I'll use that project to play along with y'all here, if that's okay. I totally love this idea :) I will definitely try to play along, because I sure do need to start using the stuff I'm hoarding! And I'd love to thrown in a prize, too - send me an email! Oh man, good thing I have enough projects in mind to cover all the months! Yipee! Thanks Kelly! I'm in!!! Thanks for the push! totally in... i have been hoarding my stash of hoe valley... no more! i am going to cut the crap out of it and make something warm and snugly! Hoe Valley...heh heh. So mature. Yay! I'm excited. I hope to complete one project each month - I have a lot hoarded and would like to stay off the tv show as long as possible! Oh, great idea. This is something I've been wanting to do, use up the hoarded stash. I think I'll start with Good Folks. Sounds fun. Thanks for the incentive to use some of my treasured stash. Oooh! 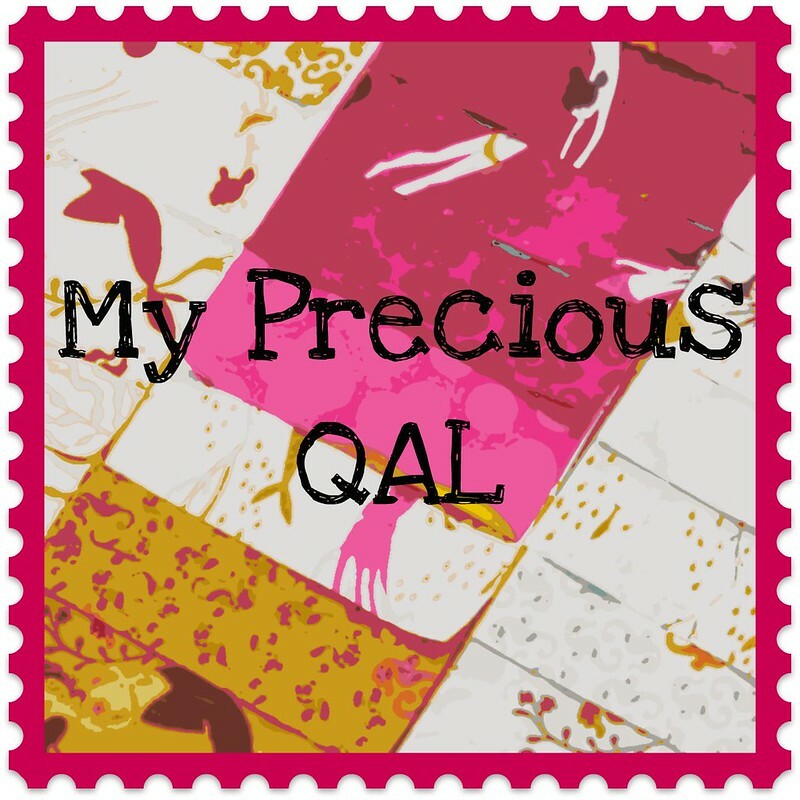 I have just seen Fiona's post about this QAL! It sounds very tempting! I have a special piece of fabric I have been hoarding, waiting for the push to use it! Thank you! I can offer a prize of my gold FMF seeds (not reprinted) and maybe one of the template sets that I developed with Jill over at tabslot. would you like that? lmk. Ill be throwing all my favs into the mix... even my blue Munki poplin art supplies and green gnomes. going very scrappy. Hi! Could you enable the copy function so I can swipe your QAL button? Not sure how you turn it on and off, but when I tried to take the code on the right for your button - as well as the image - a pop up message said it wasn't permitted. Or if you could just email it, that would be awesome. Thanks! Does Outfoxed count? How about if I haven't even taken it out of the plastic it was wrapped in to ship? Man...just typing that out makes me feel bad. I just stumbled across your QAL on Flickr - this is such a great idea! I don't honestly know if I can clear time to participate, but I did just make a pillow from some of my much loved Echo fabric. Have you been poking around in my stash? I have a small selection of fabrics that I have had set aside for approaching 20 years. I love the colors and the way they look together. I have never found a project that I felt worthy of these highly valued fabrics. I am very tempted. I still have to think about it. Once I cut them, there is no turning back. Just found your QAL and blog through another participant :) I won some fabric in the fall and I still haven't touched it because I love it so much! This is the perfect reason for my to finally break it out and make something pretty just for me. I love this idea. I have a stack of Parisville that has been begging for my attention. Woo hoo. I have a couple "precious" projects to start/finish. This is a great idea!!! Thanks for this idea. My Heather Ross Far Far Away fabrics are begging to be used before my daughter gets too old to love them. I even know the pattern I want to use but I'm nervous to see with the double gauze. This is just the kick in the pants I need! i just joined up! thanks for starting this. it is a fabulous idea. I am soooo in!!! This is probably a silly question, but what do I have to do to 'link up'? Well, I want to do this, I have lots of hoarded fabric, my problem is which pattern to use or what design to use???? But I will look in my stash and try to get something done by May 15, good idea! thanks for the push! OK just realised it's too new to be in the sew a long. Oops sorry- I'm out then, ignore my last comment! I am in! Cutting into that Heather Ross Macaroni Love Story here I come! Hi Kelly, I'm a novice quilter and I've just found your blog from another participant and was wondering whether is it too late to jump in the bandwagon? I've been hoarding my Echo line and thought of making simple patchwork quilt with 6" squares. Does that count for large pattern? Just broke into my Heather Bailey Pop Garden Stash to make two quilts! Thanks for inspiring me! Okay, I'm in. Twice! I have a Lily & Will jelly roll (the original yellow and brown one) that I keep thinking about when I can't sleep, and a small amount of Patty Young's hummingbird fabric that I haven't been able to bring myself to cut into, even though I know it would make the best cover for my ereader. I just saw your button on another blog so decided to check it out. I would love to join - just this morning, I again looked at my one yard of Wonderland that was one of the first pieces of fabric I ever bought and still haven't used since I've been waiting to find the perfect project. Well, I guess the wait is over because I am going to join your QAL and figure it out! Thanks. I would love to be in it I have a hat box of fabrics in pale pink black and cream , I have been hoarding to make a tablecloth. 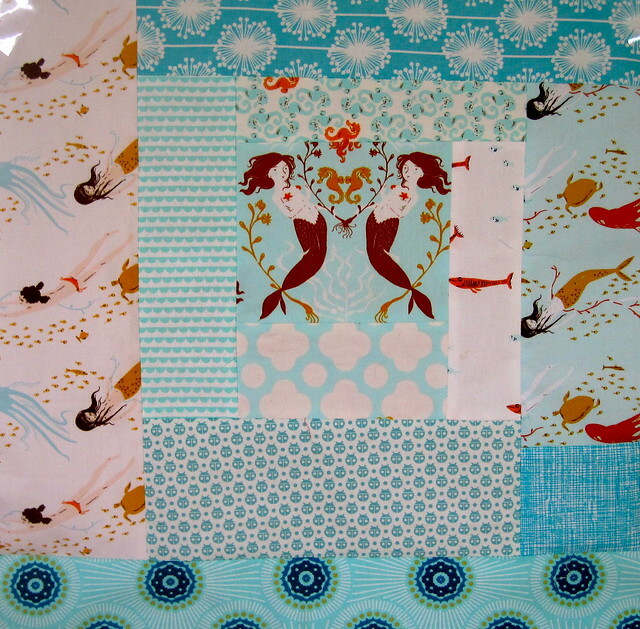 does this count as a quilt as it will be big and I will be backing it and free motion quilting it ? I've just decided to join too! I'll be breaking' out the good folks for the retro flowers qal. A bit excited! Can't remember if I posted to say I am committed to trying to finish 2 quilt tops during this QAL! Shared my bundles with the flickr group and have just started cutting Quilt #1! Okay boss, I'm making a big star quilt with my precious. I read the rules and it says I don't have to be done but have to post something new each month. So can I still be working on my star blocks? Is that considered something new? Or do I need the top pieced by June 15 to qualify?? I just joined and made a table runner! Thanks for the inspiration! I'm coming late to the party! But I have some fabric with scrapbooking and quilting motifs that I've had forever and have been scared to cut into. This is the push I need! Please tell me how I get the pattern for the pixelated heart?